The Bionomic NaHS modular production system utilizes multistage gas absorption devices in a two- step process that offers extremely efficient sodium hydrosulfide solution production using hydrogen sulfide and sodium hydroxide as the feedstocks. The Bionomic process consists of two absorption and reactor stages operating in series each incorporating a two stage hydrogen sulfide absorber arrangement that can achieve highly efficient 99.99% conversion of the hydrogen sulfide to NaHS. 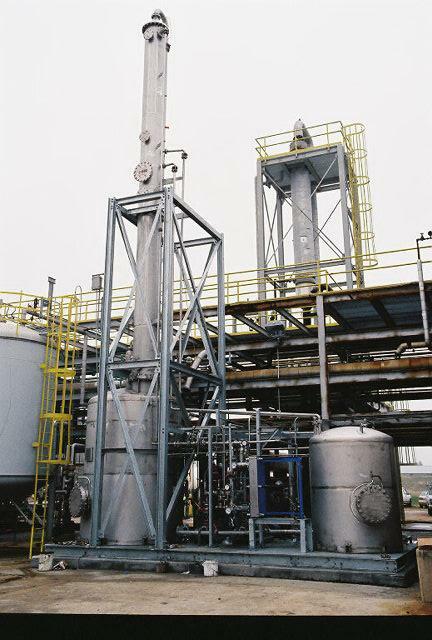 Each stage utilizes a unique design jet venturi followed by a packed absorption column situated over a reaction tank. This two stage combination multi-absorber set up combined with close temperature controls enables the process to run at optimum uniform product temperatures ensuring high quality NaHS production and reduced hydrogen sulfide off gassing. Precise controlled feeding of reactants with close temperature controls also ensures intermediate sodium sulfide concentrations are also held to within a specific range to eliminate unwanted precipitation. Operating in this two stage arrangement the hydrogen sulfide feed gas in the first stage is converted to sodium hydrosulfide. 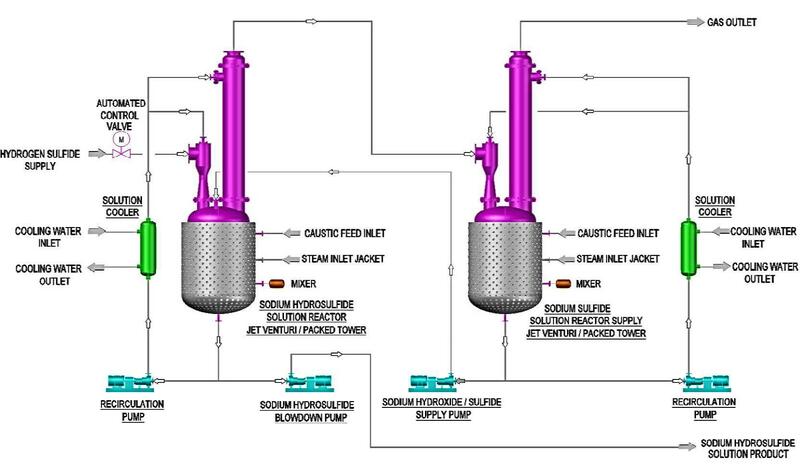 The second stage is used for polishing the hydrogen sulfide residual and to produce the required sodium sulfide feed solution for the first stage. For most installations, this second polishing stage enables meeting stringent state and federal air quality regulations without any further effluent treatment. The standard system can be tailored to produce a large variety of NaHS solution concentrations ranging from 20% through 45%. The system can be configured with the logic to operate fully automated in either a batch or semi-batch continuous operation. Redundant instrumentation and transfer pumps adds to the systems overall excellent operational reliability. Higher solution concentrations including flake form can be produced with additional processing steps that can include evaporators, solidification and flaking equipment as required.